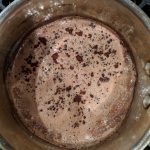 Connecting fitness, recipes, nutrition and philosophy. I wanted to change things a bit this morning for kids breakfast. We sometimes eat chocolate for dessert, but it’s more rare that we try it early in the morning. 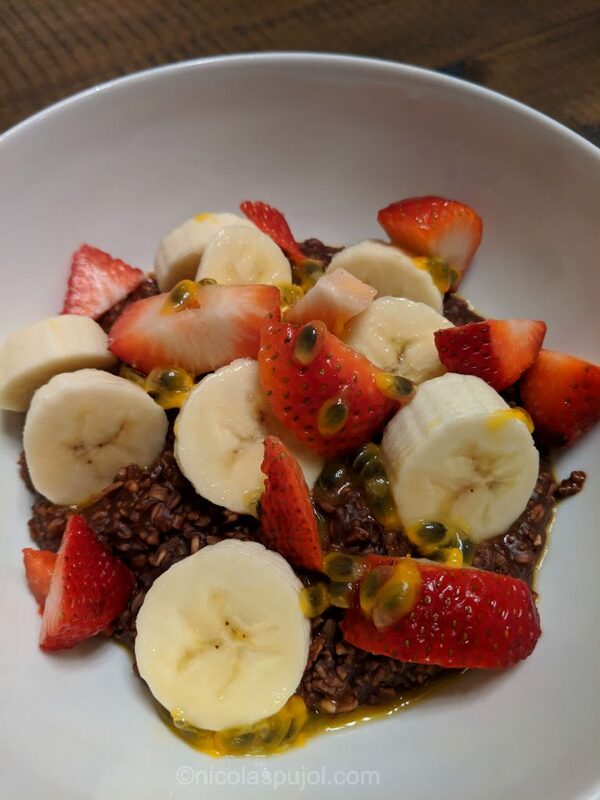 So to keep the traditional breakfast a bit of a surprise, this chocolate oatmeal topped with fruits did the job. As much as it would be easy to put sugar or other forms of sweetener by default, I would like for our kids to develop the taste of things. What do I mean by this? Our culture has formatted our taste buds to like certain ingredients, such as salt, sugar, oils, and hot sauces. When you try a dish without any of these, your brain might tell you “hey, what’s this?”. This is the taste of the actual ingredients, nothing added. 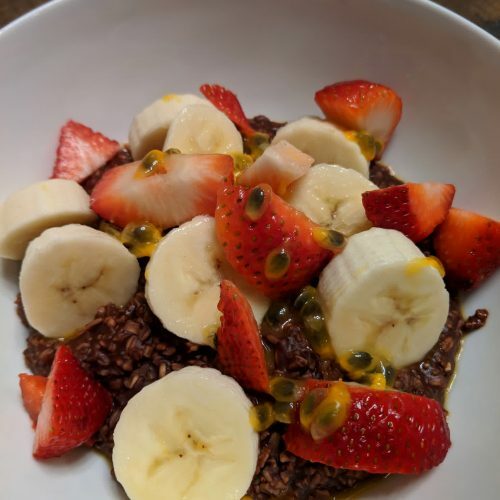 This oatmeal recipe uses unsweetened almond milk, plain oats, unsweetened cocoa powder, fresh banana, strawberries, and passion fruit. My 13-year old tried it initially, and said “it’s a bit bitter”. It can feel that way, as is. We added a teaspoon of honey (you can use maple syrup to keep the dish 100% plant-based), and sprinkled a little bit of extra almond milk. Then he found the taste just fine. It may or may not look like it, but this breakfast bowl is quite filling. The ingredients pack plenty of dietary fiber, complex carbohydrates, and the cocoa powder adds to the sense of satiety. 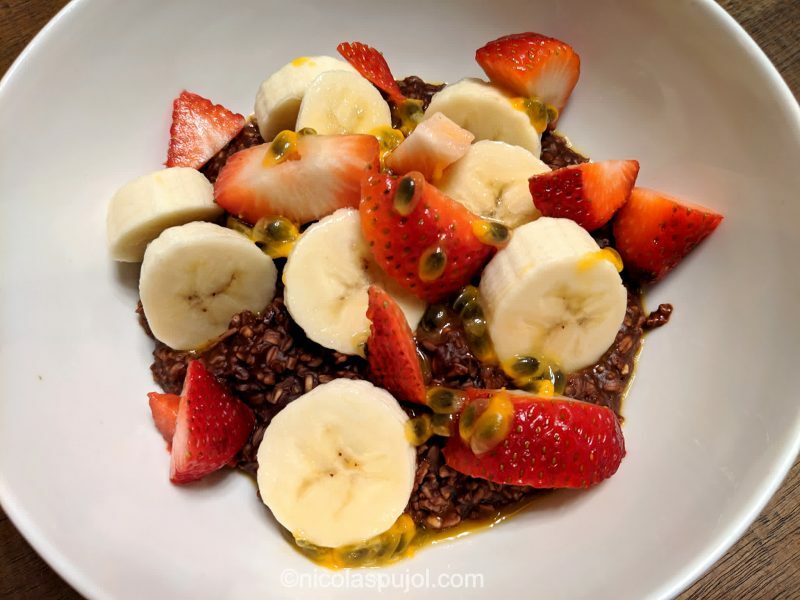 From our family to yours, we hope you’ll enjoy this chocolate oatmeal topped with fruits. 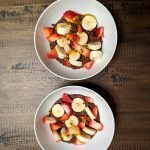 This chocolate oatmeal topped with fruits provides a filling breakfast using unsweetened almond milk, cocoa powder, banana, strawberries and passion fruit. 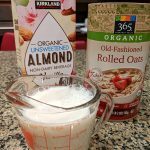 Combine the oats and almond milk in a pan and bring to boil. 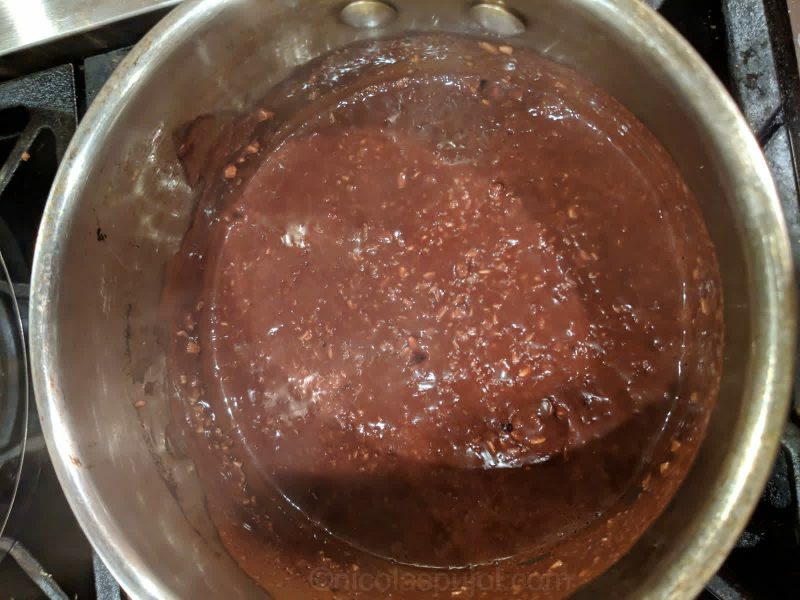 Lower the heat, add the cocoa powder and stir well. 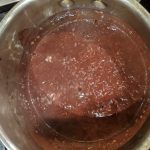 Continue cooking for oats for 7 minutes (or indicated time on your oats instructions; different types vary), while stirring frequently to avoid the bottom burning or clumping. In the meantime, slice the banana, strawberries and cut open the passion fruit. Divide the cooked oatmeal mix into two large bowls. Top with fruits, then scoop the juice out of the passion fruit on top. Serve as is, or for a slightly sweeter version, add maple syrup (or honey) and a little bit of extra almond milk. 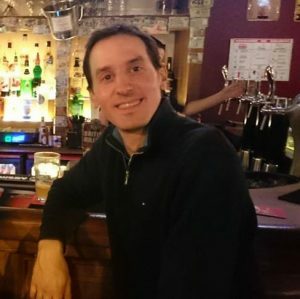 Nicolas Pujol is a life enthusiast, technology executive and essayist. 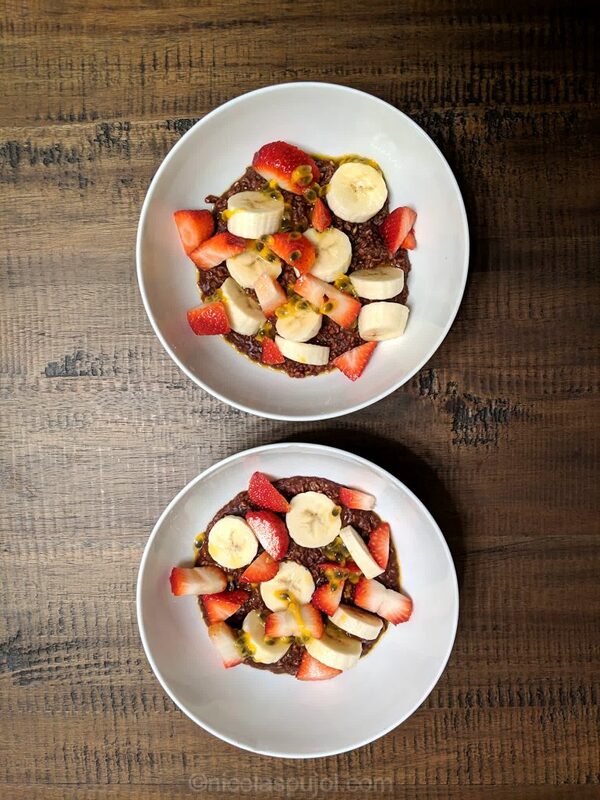 His personal website connects fitness, nutrition, recipes, philosophy and travel. He blogs about technology at Firstpractica.com, and about lifestyle at Laylita.com. His books explore oneness, how everything is connected. 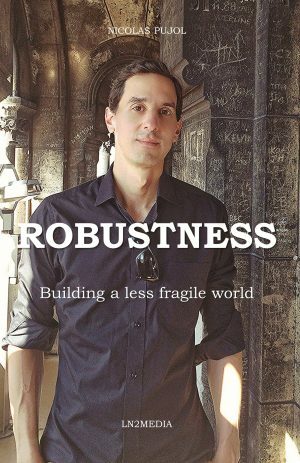 He is the author of The Mind Share Market and Robustness. Thanks for checking out this site. Let me know what you think by contributing a comment or reaching out directly or through social media. You can opt out at any time. No spam, no fee. Just love.